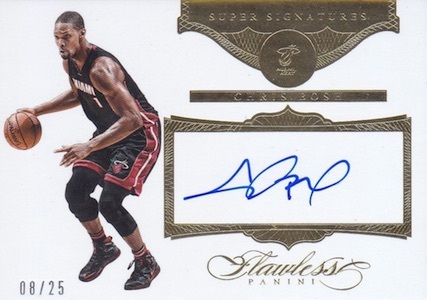 The peak of the high-end basketball market, 2015-16 Panini Flawless Basketball keeps the familiar elements of the brand but also brings several new options into play. Closing out the 15-16 collecting season, every box offers seven autographs and one jumbo memorabilia card in addition to a pair of gem base cards. 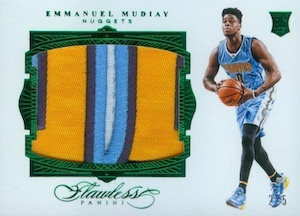 One of the hallmarks of the release, the encapsulated base set displays the extreme rarity of 2015-16 Panini Flawless Basketball with a main Diamond (#/20) set that is enhanced with Ruby (#/15), Sapphire (#/10), Emerald (#/5) parallels along with an oversized 1/1 Diamond parallel. 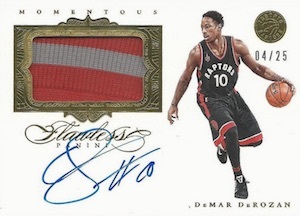 Making their Flawless debut, 2015-16 Panini Flawless Basketball includes both Logoman relics and Championship Tags. 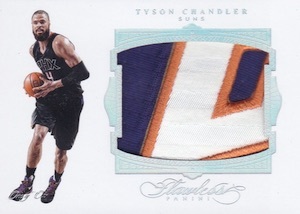 While the NBA logo is famous in its own right, the Championship Tag patches are a newer addition to the NBA jerseys which celebrate the total title success of each NBA franchise to win the Larry O'Brien Trophy. Flip Saunders, the late coach of the Minnesota Timberwolves, is remembered with the Flip Saunders Tribute that includes "Flip" patches worn by his players to honor him after he passed. 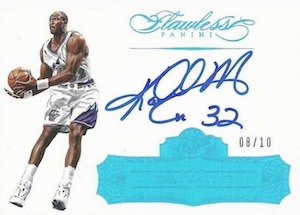 In addition, 2015-16 Panini Flawless Basketball features the normal assortment of autographs and jumbo relics for top current and former players. This includes choices such as Momentous Autographed Memorabilia, Patch Autographs, and Super Signatures. All cards in the entire set are numbered to 25 or less. 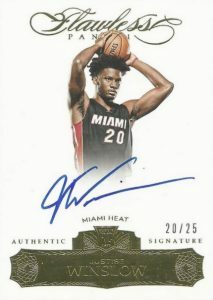 While the total amount of cards remains unchanged from 2014-15, collectors will find an added autograph has replaced one of the relics. 150 cards. Serial Numbered #/20. 61 cards. Serial Numbered #/25. 30 cards. Serial Numbered #/2. 29 cards. Serial Numbered #/2. 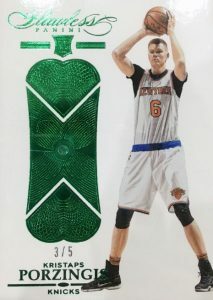 PARALLEL CARDS: Ruby #/15 or less, Sapphire #/10 or #/8, Emerald #/5 or less, Logoman 1/1. 12 cards. *Card #15 found only in parallels. 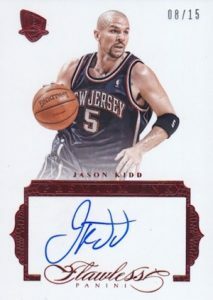 PARALLEL CARDS: Ruby #/15 (*Card #14 - #/14), Sapphire #/10 (*Card #15 - #/8), Emerald #/5, Platinum 1/1. 41 cards. Serial Numbered #/25. *Card #1 found only in select parallels. *Card #25 found only in Sapphire parallel. PARALLEL CARDS: Ruby #/15, Sapphire #/10 or less, Emerald #/5, Platinum 1/1. 39 cards. Serial Numbered #/25. *Cards found only in parallels noted below. 36 cards. *Cards found only in parallels noted below. PARALLEL CARDS: Ruby #/15 (*Cards #42, 44 - #/12), Sapphire #/10 (*Card #44 - #/8), Emerald #/5, Platinum 1/1. 90 cards. Serial Numbered #/25. 26 cards. *Cards found only in parallels noted below. PARALLEL CARDS: Ruby #/15, Sapphire #/10, Emerald #/5 (*Card #38 -#/2), Platinum 1/1. 76 cards. Serial Numbered #/25. PARALLEL CARDS: Sapphire #/10, Platinum 1/1. So silly to have 15-16 product release as the 16-17 schedule gets underway. They really should have a better cutoff for these things. I dont get why this product priced so high – $3,600 for 10 cards is insane considering that the design did not improved a lot in the past 3 years. Anyway, I like the Transition set idea – it works very well for retired players, but not really for actives. Just look at Dwight Howard – in this years set you can have him in 3 past teams but you’ll never have it Atlanta jersey. Szabi � $3,400+ is the case price (2 boxes). Individual boxes are in the $1,700 to $1,800 range. Still a massive price for ten cards. Very expensive, especially if you pull some junk and the resale on those are not even close to the sticker price on the box. 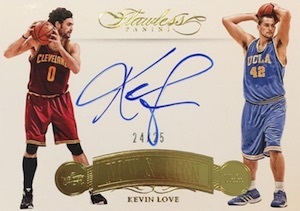 I looked forward to the release of the 2015-16 Flawless basketball. While it has some beautiful cards I observed two things that make me not like it as much as last year. 1) There seem to be so many horizontal style cards. 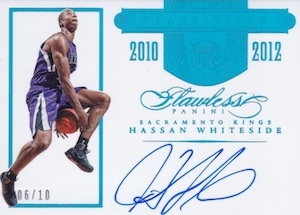 I really prefer vertical style cards for autographs. 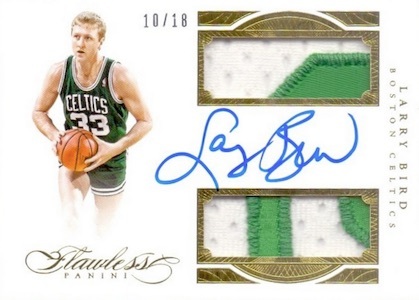 2) My favorite part of last year’s set – The Hall of Fame autograph subset – is not included in this set. It included some great past as well as present day players. Very expensive but some nice quality autos/patches. 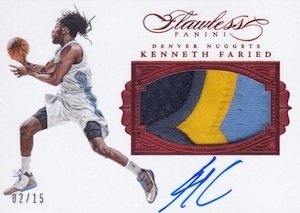 Not a huge fan of the base non-auto or patch cards but overall not too bad. I’m a collector of some retired players so having new ones for those guys is great. probably the only people who buy this product go to vegas and lose big. 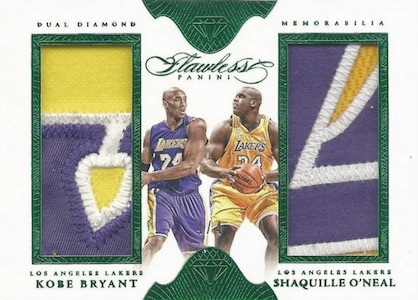 I’m a big time collector former diamond club member, but this stuff is way overpriced. I’d rather take the box price put it in my pocket for a year and get some really great cards later, I’d much rather play craps than gamble this way.